SKU: 9016. 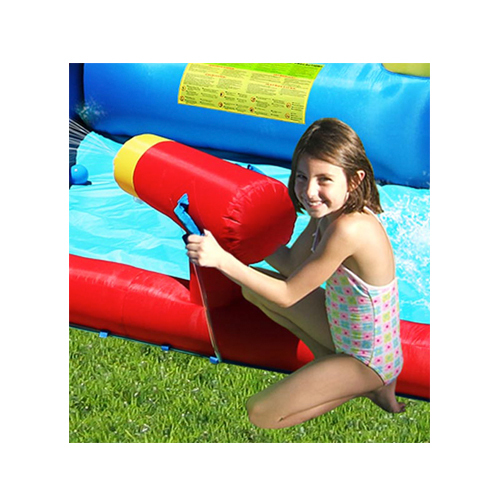 Categories: Jumping Castles, Inflatable Water Slides, Wet & Dry Combos, All Products. Tags: 30 Plastic balls, Water Cannon. 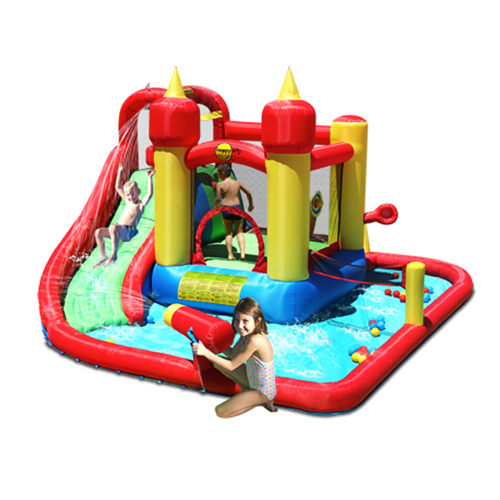 This multi featured Jumping Castle contains a jumping area, basketball hoop, ball pit, dart board, water cannon and a water slide leading to the refreshing pool of water. 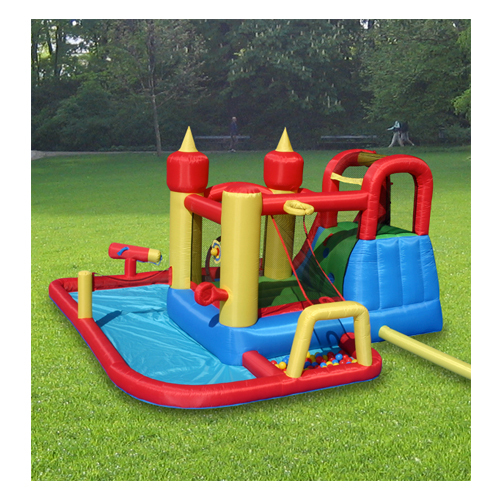 This castle is perfect for all seasons and can be used both wet and dry. 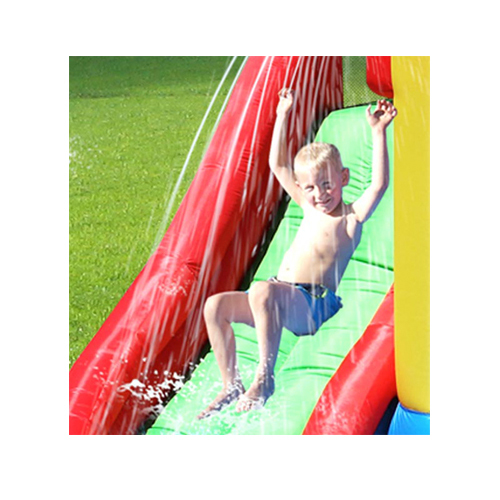 Suitable for outdoors and open areas, for a refreshing time of fun filled play time on a hot summer’s day. My kids and their friends have spent 5 hours using this today. Best money we’ve spent. Absolutely brilliant being able to use it wet and dry. 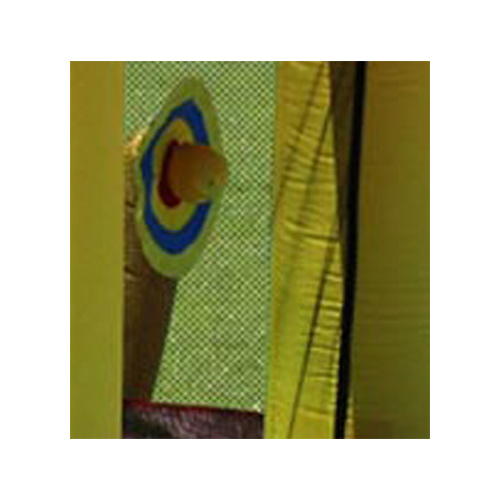 Product is well made, easy to assemble and was shipped very quickly. Our kids are aged 2 & 3, it was the perfect size for them to climb up to the slide, (much safer with the jumping castle section in between) the bigger kids loved it as well. Completely happy with this purchase! 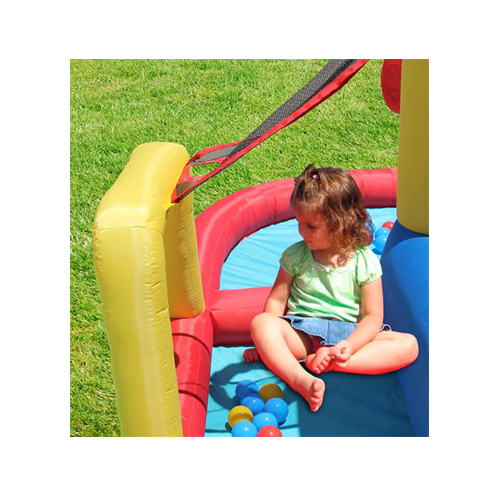 Absolutely love this jumping castle. 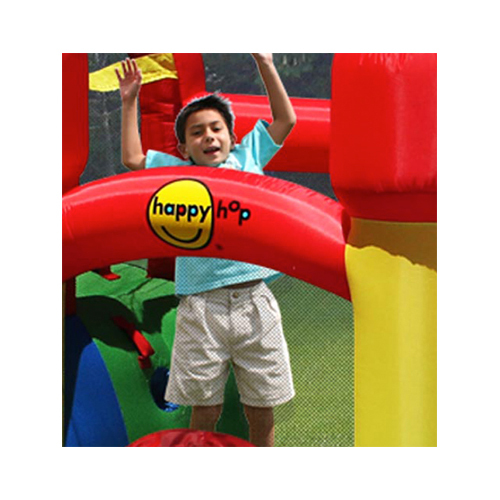 It’s our second Happyhop brand castle we’ve purchased and I can’t speak highly enough of the quality. Provides all day entertainment for the kids. In regards to service, rang up Little Kids Jumping Castles and they arranged for next day delivery so I received the castle less than 24 hours after purchase! And they kept me up to date throughout and were so nice. Highly recommend!!! I bought this as a joint Christmas present for my 9 grandchildren to use at Nanny and Pops. We did a trial run with 2, 5 yr olds, a 2 yr old and an 18 monther. The children spent 5 hours having a great time both on the slide and in the wading pool. Would recommend product to other families with children of like ages. Looking forward to a wet and wild Christmas! Purchased for our 2.5year old, it has been well worth the money. I’d say prob best for kids up to maybe 5yrs. Easy for one person to put up and down. Super quick delivery and great communication. Lots of fun and entertains for hours! The hardest part is to get kids off it late in the arvo. One of my best purchase. We brought this for Xmas for out 3 year old and 7 year old and they love it !!! I have purchased 2 of these for different families as Christmas presents. It was easily set up on Christmas Day and multiple children (ages 2-6) had a fantastic time. Love that it can be used both wet and dry. Although large when set up it is easily packed away for storage. Highly recommended and a wonderful way to keep a group of children entertained. Awesome, kids love it ages 1 to 7 have used so far and all can’t get enough.